Without a government crutch, all the big banks, all the big insurance companies, and all the auto makers would be broke. At least, that's what I take from the current situation. Hey, if you can swim, you don't need the life jacket. GM is currently camped out at the door of the Bankruptcy Court like a groupie waiting for a concert ticket. Our lying government already gave them what, $30 billion? The guy that sleeps in the White House proclaimed not long ago that GM was 'too big to fail'. That was at least what he was told by the man in charge - Ben Bernanke. By spewing this idiotic lie, the profoundly stupid American public didn't bat an eye at the first loan. Now, it looks like Bernanke will take over GM and write another check for $50 billion in the process. He now owns insurance, banks, and auto manufacturing. Are we sure this guy is not Bin Laden in a banker suit? He has a beard already. America has surrendered. We gave up because for the moment, it looks like our precious stock market is not in danger of caving in. In fact, we are still in the Bernanke rally that began on March 9 when our fearless printing press addict told us in no uncertain terms that 'large banks would not fail'. Well, BITE ME!!! Freedom means you have the right to fail. You have the right to be an incompetent moron capable of running any company into the ground. Investors have the right to throw away all of their money because they are too stupid to see that companies that change their address to Bankruptcy Boulevard are not good investments. Americans used to hold freedom as something so precious that we were willing to send our sons and daughters into combat to defend it. Now, we are not willing to even let capitalism work so to hell with freedom. Bring the troops home on the next ship while we can still afford the gas to get them home. They are fighting for nothing! We have nothing but a fake-0 market built on lies and 'convenient' accounting. Okay, the stock market is in rally mode. We may tack on another thousand or two points to the Dow and maybe even challenge 11,000. Isn't that what you want to hear? Aren't you willing to give up everything to see 11,000? Well, you already have given up everything. Yes, the stock market can rise with some of our biggest companies going bankrupt, unemployment topping double digits, GDP shrinking, and real estate dissolving. Our living standards are in reverse and the culprit is the printing press that Bernanke runs night and day. Printing money causes inflation. Ah, but some of that printed money makes its way into the stock market. Happy now? Sure, you are going to have to pay more for gasoline and groceries but think about all the rich bankers and politicians you are helping. And sure, you have already sacrificed the freedoms that our forefathers spilled blood to protect. But heck, we have a stock market rally. That's all we care about so Bernanke is gracious enough to give us a small sip from the cup of affluence. So what if we really weren't real estate geniuses after all. At least we are all still stock market 'jeniuses'. Trust me. When the stock market is going up, everyone thinks they are a genius. When it is going down, investors either withdraw their investor membership and run to some crappy fixed investment that pays them nothing or they whine that the government should fix things. Well, BITE ME!! To top off the month of May, the WHO (White House Occupant) put forth a supreme court judge nominee that thinks her ethnic background of being a Latino woman makes her decision processes superior to that of white males. I suppose she extends her bigotry to African American males as well. For that matter, she is superior to white women, Asians, Indians, and anybody else that doesn't look just like her. All things considered, I think America deserves a person like this who will sit on the highest court in the land. Since we have taken a detour down Stupid Lane, we might as well go all the way and run naked through a briar patch. Of course, the average American can't even spell 'Supreme Court' much less have any idea what those people in choir robes do. Well, BITE ME!! What are you even reading this for? The only thing that matters to anyone is the market rally. Look at the chart below. This is a one-week chart of the Dow with 30-minute bars. The index gained about 320 point on the week and ended just a touch over 8500 thanks to a 100 point five minute burst at the end of trading on Friday. In fact, the entire gain of the week was due to three of the 30-minute bars. Yep, the week's entire gain came from an hour and a half of trading. The message that Bernanke wants you to know is simple. His market will move in short bursts. Don't miss them. Besides, the only freedom you have left is the freedom to buy stocks! Think I am exaggerating? Wait till the next Supreme Court justice gets through with you and your inferior decision making skills! All it takes for our new era stock market to lurch forward is an hour or two. In the week ending 05/22/09, we had a one day rally of almost 3% across the board on Monday. Presto! the Dow moved higher from the 8200 Bernanke line of intolerance. The rest of the week went negative every day so we wound up where we started. This was a lesson from our new leaders. One, they obviously wanted to take the rest of the week off as we looked forward to a Memorial Day weekend. Without our government buying stocks each day, the market is liable to slide toward zero at an unsustainable pace. Two, our new government wants to put the fear of the Fed in the short sellers of the world. Rallies will form from nowhere based on nothing and the markets will lurch higher as the government wishes. Why not just board the train of irrational optimism and play along with the con? Well, there are a few weeds in the 'green shoots' of economic growth that the government is selling these days. The Fed themselves now believe economic recovery will not happen this year. Further growth will even be slower than previously thought. GM and Chrysler are broke and have joined the government dole for daily survival. Housing starts slackened to the lowest on record. Unemployment is pressing 10% (even by government figures). We all know the stock market 'climbs a wall of worry' but this is ridiculous! This is reality. The task for our new government is to blow the next bubble in the stock market and hope that their precious banks can enrich the masses so we return to the mortgage offices and car dealerships with cash in hand. All depressing economic negativity aside, we have to make the stock market go up on declining earnings and shrinking economic activity. That means the market will have to support the eventual highest valuations ever. Of course, you can accomplish this task as long as you have a printing press and a completely ignorant populace with no clue as to the destructiveness of such monetary printing. Good luck, Mr. B. Here is the way the government plays us. Our government is heavily indebted and we all know and accept this fact. So, the Treasury issued $44 billion in bonds. The world cannot absorb all this debt so the Fed kindly announced that they would buy $7 billion of these bonds. Of course, what really happens is the Fed buys the bonds from the banks and now the banks have $7 more billion to lend and play with. Using the lending power of '9', that $7 billion becomes $70 billion. 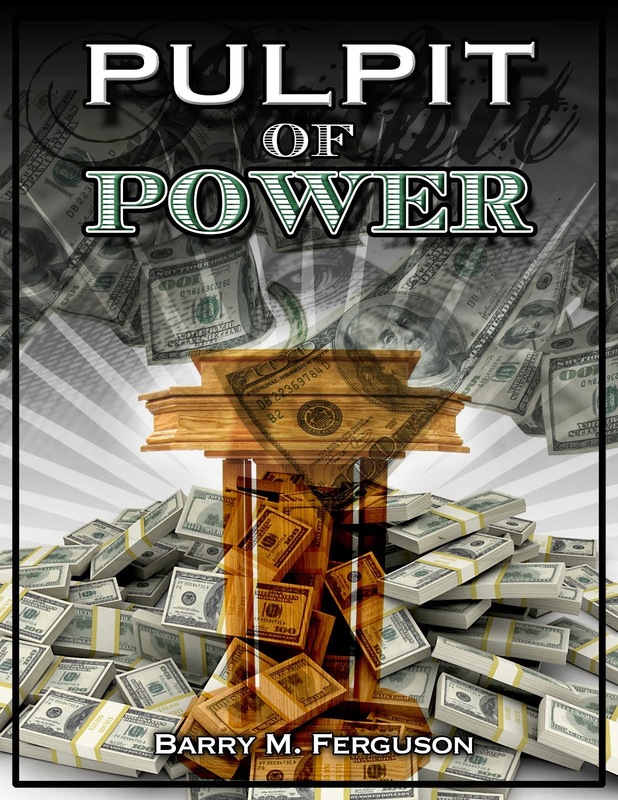 If you are keeping score, our government borrows $44 billion and with Federal Reserve help, turns the exercise into a $26 billion dollar currency injection. Gee, I wonder if some of those billions will find their way into the stock market? Only in America! I'm sure you are familiar with the children's game 'Where's Waldo'. The idea is to find Waldo amongst a camouflage of graphics. 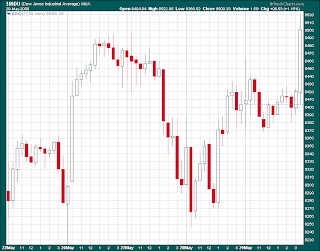 The S&P 500 lost some 5% for the week and we have to wonder, where's Bernanke? I panicked a few weeks ago when Bernanke's right hand conspirator, Tim Geithner, was making a speech somewhere early in the morning as the Dow was opening lower. My panic was calmed as I noticed the location of the event was in Washington. Wheew! At least our main man was close to the printing press. Without it, we have nothing. And fortunately, neither Bernanke nor Geithner is one bit afraid to unleash the power of the press. Why am I somewhat negative, you ask? Well, in the last year, all of the investment banks in the US have folded. This past week has seen the bankruptcy of Chrysler. Any day now, GM will follow. Housing continues to collapse and unemployment continues to rise. Job creation is negative and governmental lying continues to be downright pathological. For instance, House Speaker Pelosi claimed she was 'misled' by the CIA on waterboarding but there are some alleged documents that would prove otherwise. No one can tell the truth about anything anymore. When that happens, I have to think things are terrible. Why is the lie so necessary? Why does our government talk about 'green shoots' of economic reprise when the facts are so diametrically opposite? Why does our government think they can run banks and auto manufacturers and health care when they can't even get my mail to me on a consistent basis? Again, they lie because they know that we cannot handle the truth. The government said that retail sales slid .4% but the number would have been a tenth worse if it weren't for an uptick in auto buying. See, someone should tell the car makers since they are more busy preparing for bankruptcy than they are building more cars. In addition, the 'economy' that we speak of these days is a worldwide economy. Sony announced that they lost a billion for the year and Panasonic lost four billion. Toyota's sales are way down and oil tankers are dropping anchor. Reality is a bear! Unfortunately, bears don't eat money. Otherwise, Ben and Timmy would have them all at a fat camp by now! 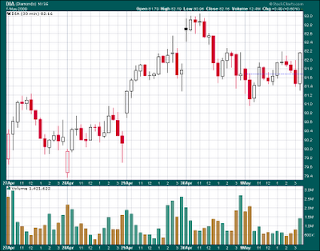 Let's look at a one-week intra-day 60-minute bar chart of the Dow for the week ending 5/15/09. 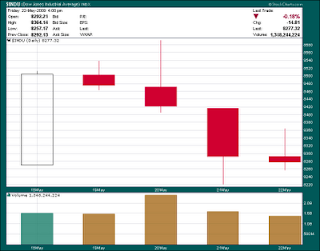 Yes, the Dow was down but you can see the week's total loss was due to about 3 hours of trading (3 long red bars). This is not in and of itself very significant these days. Almost all trading movement is done in short bursts. The question is really why didn't Bernanke step in to halt the week's downslide? After all, he is the new keeper of the stock market. Without him and his stock market interventionist role, we have nothing. Well, for one, since the Fed started the current rally on March 10, the Dow has come a long way. A cool off is okay. Two, the markets' leader, the banks, have come a very long way on their crumbling pillars of deceit. A cool off is okay. This gives the illusion of an actual 'market' when in fact, there is none. The Dow goes where our new government wants it to go. I suspect the Dow will be rallied in the coming weeks to push it over the 9000 threshold. Why? This was the last lower high in the downtrend. Then, Ben can say the 'downtrend' has been broken. All it takes is money! Print on, my man! On March 9, 2009 Ben Bernanke gave birth to the current rally by issue of proclamation that there would be no more 'big bank failures' in the US. By virtue of the return of 'mark to fantasy' accounting, Citigroup said they made a profit. Instantly, our current rally began. Of course, Bernanke now owns the banks as illustrated by his mandate to Bank of America CEO, Ken Lewis, to buy Merrill Lynch or else. That else included a pink slip. Now you know who's boss! Since the Fed's coup of August of 2007, I have been documenting this abysmal turn of events in American history. As April wound down, all analysts were trying to gauge the effects of the Fed's so-called 'stress test' on banks. Most guesses were that the big boys would be required to raise hundreds of billions in capital. Big deal. The Fed will give it to them even if they have to take it from you and me. The big effect? Nothing - and the Dow rally rolls on. Besides, after jacking the shares of all banks higher for the past six weeks, why would Bernanke let the bank rally fail over a silly little detail like lack of capital. No one stops a scam in mid-scam. He will see it through. Interestingly, with the Dow at close to 8200, it now has a P/E of about 30. We can't say for sure because earnings are no longer for sure. With mark to fantasy accounting, earnings have become whatever the Fed needs them to be. Therefore, unless the Dow drops some 50% very quickly or earnings improve significantly really fast, the market is grossly over-valued. But, and this is a big 'BUT', we are in a different era now. This is a government run market and a government run economy. Capitalism is muted and federalism reigns supreme. Earnings no longer matter anymore and market rallies can be sustained because the Fed says so. The Governmental Department of Pathological Lying (ie, the Commerce Department) claims that consumer spending increased by 2.2% in the first quarter. See, the economy is improving. That is, unless you believe their reported GDP number of minus 6.1%. Now remember, a large part of GDP is consumer spending. If consumer spending was up 2.2%, how could GDP be down 6.1%? We must also remember that a large part of GDP is government spending. What number would you like to put on that? Do you think it declined what with bailout - stimulus- debt ballooning politicians carrying on the Fed's manifesto? I find this, and all numbers our government puts out to be more fictitious than the tale of Little Red Riding Hood. But, with the economy on the ropes and gasping for air, the government needs a stock market rally and that is what they are going to get. If there is any bad news like contracting GDP, there has to be some good news to offset it like consumer spending. Truth is the enemy of the State as Joseph Goebbels, (Nazi Propaganda Minister) said. Damn the earnings and fundamentals, full speed ahead! I won't repeat the real economic numbers. They are all bad. The government wants us to believe, however, that they are getting 'less bad'. It's like if you were shot in the carotid artery, you would begin to bleed profusely. That would be very bad. Soon, your body would run low on blood and the flow of blood would lessen. Oh, that's good. You are getting better. Stand up and do jumping jacks! But, we want a market rally so we are willing to believe anything to make that possible. Oh, by the way, Chrysler declared bankruptcy one day after claiming to secure agreements with creditors. Liars. Then Mr. Obama said that 'bankruptcy was not a sign of weakness'. Nah, it's just a flesh wound. Strong companies declare bankruptcy everyday. Who's next? Exxon? Walmart? Microsoft? Is everyone on acid except me? Why didn't someone from the press question the man about this statement of deception? Is the media brainwashed like the Obama-nites? Hey, don't jeer me. The Republicans are just as stupid and inept as the Democrats. America is a country devoid of leadership. It is also a country devoid of intelligence. Else, how else do we let such stupid people run our country? Okay, let's talk truth. Chrysler is run by a hedge fund and venture capital group. They apparently bought credit default swaps that would repay them if Chrysler went bankrupt. Our government offered them a deal to accept pennies on the dollar for their debt but they did not accept. Why? Well, they were talking to bailout Barrack. Again, don't jeer me. The idiots before him started the bailouts and now the new guy is just doing what the old guy did. Why? Because he is told what to do by Lord Ben! Anyway, the owners of Chrysler will come out better because of their derivative operations if the company declares bankruptcy. So, derivatives strike again. Why won't there be any legislation passed by the current administration to limit the use of derivatives? Because the Fed runs the derivative show through the Bank of International Settlements. Game - set - and match. 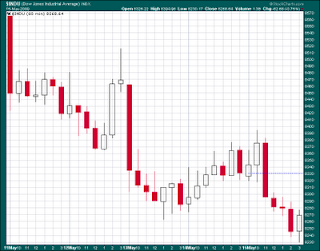 Below is a 5-day chart of the DIA ETF. As always, note the volume at the beginning and end of each day. This is when the PPT is most active.